In celebration of The Walking Dead’s 15th anniversary, Skybound and McFarlane Toys are releasing a killer San Diego Comic-Con 2018 exclusive The Walking Dead action figure box set highlighting the evolution of Rick Grimes. 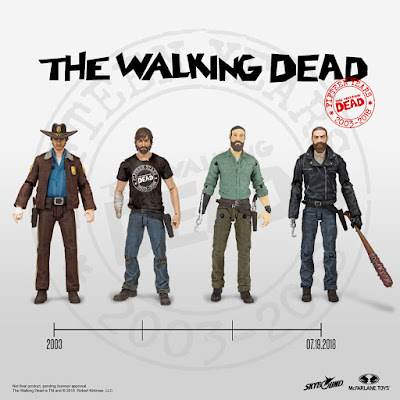 This limited edition action figure box set features four versions of the iconic comic book series’ main character, Rick Grimes, from throughout the series 180+ issues. The San Diego Comic-Con 2018 Exclusive The Walking Dead 15th Anniversary Rick Grimes Action Figure Box Set includes Sheriff Rick Grimes featuring a brand new sculpt, a repainted version of the All Out War Rick featuring a The Walking Dead 15th Anniversary T-Shirt, a repaint of the A New Beginnings Rick from the cover of Issue #149, and a brand new sculpt of “Negan” Rick from Charlie Adlard’s variant cover for Issue #163. 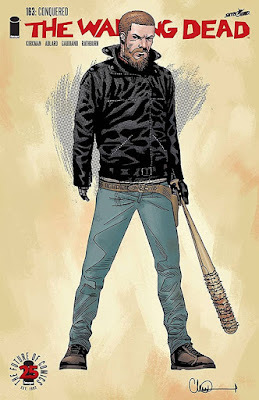 As with most limited edition The Walking Dead action figure releases from Skybound and McFarlane Toys from the past few years, this SDCC set will be released as a Color Edition and a Bloody Variant Edition. Each four figure box set will retail for $100 and can be purchased at the Skybound SDCC booth in July with any remaining stock available online after the convention at the Skybound online store.